Before you can sell your product to somebody else, you must be 100% sold on it yourself. Otherwise, you can’t sell with conviction, and no matter how much you try to fake it, people will see right through you. Conviction comes when salespeople believe so strongly in the value of their product that their single driving motivation is to provide value to their customers. The truly great salespeople in this world are more anxious to provide benefits to their customers than they are to receive large commissions. When money is the major driving force, salespeople rarely succeed. Prospects can see the dollar signs in a salesperson’s eyes, and it’s written all over their faces. You must think abut the best interests of your customers. Your interests should be secondary. Forget about the money; those large commission checks will come automatically when you look out for your customers. You must believe your product is the best value of its kind. An excellent way to demonstrate it is by putting your money where your mouth is and owning it. I always drove a Chevy, yet I saw Chevrolet dealers drive to their showrooms in Cadillac’s and Mercedes. Anytime I’d see them do that, I became a little sick in the stomach. Sure, I could have afforded to own any car, but by doing so, my customers would think: “Girard thinks he’s too good to drive what he sells.” To my way of thinking, that’s a stupid message to convey. No matter what you sell, you should own it yourself. If you want your prospect to warm up to your product, you’d better show him or her that you’re hot on it too. It just makes good sense to practice solid brand loyalty to the product line you’re selling. You should use, drive, wear, carry, display and talk up the product you sell. Your prospects and customers will think, that’s a pretty strong recommendation if they see you using the product. There’s a definite message—a negative one—that people send when they fail to use their own products, which put food on their tables. I remember reading an article in Fortune magazine titled “How I Would Turn Around GM,” by the outspoken Ross Perot. He opposed top managers being chauffeur driven to work. Perot declared that “anyone who needed a chauffeur to drive him to work was probably too old to be on the payroll.” And that anybody who worked at a car company ought to be driving his own car because you didn’t get much of a feel for how the car handles in the backseat. When you don’t use the product you sell, you’re signaling: “It’s okay for you to use what I sell, but it isn’t good enough for me.” Now that’s not a message you want to send to your customers. 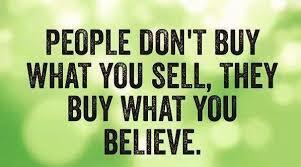 Demonstrating your belief in what you sell is basic and is applicable to every product, not just automobiles. You must also know about the product you sell, understand it and what it does. Learn its features, its advantages and its benefits. If you don’t know everything about the item you’re selling, you have no business selling it. A lot of salespeople do nothing to prepare for a potential customer or sale. They don’t know anything about the customer and, worse yet, they don’t know their products or services the way a customer has the right to expect they should. You need to be prepared to deal with and overcome any legitimate concerns customers might have about the product or service they are getting. Look at the product you’re selling from the customer’s viewpoint. You have to understand the customer’s wants and needs. It’s all part of fitting product to prospect. People buy your products really not because they understand all that much about it, but because they feel you have some kind of understanding about them and the product your selling them.